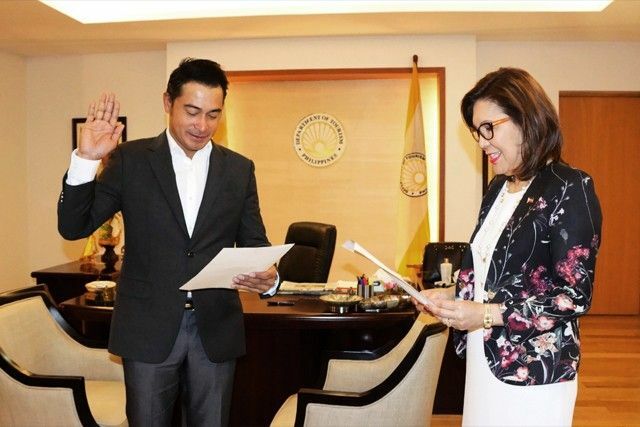 In this Dec. 20, 2016 photo, Tourism Secretary Wanda Teo swears in Cesar Montano as Tourism Promotions Board COO. MANILA, Philippines —Employees of the Tourism Promotions Board recently filed complaints against board Chief Operating Officer Cesar Montano, an actor. The TPB employees formalized their concerns and complaints in a letter that the Presidential Action Center received March 1, 2017. The complaint listed 24 irregularities allegedly committed by Montano. Employees cited Montano’s incompetence as COO, saying he has difficulty grasping information during meetings. He also allegedly rarely reports to Tourism Secretary Wanda Teo and sometimes locks his room for hours and could be heard playing the guitar inside. “It can be observed that during meetings with the TPB Management Committee and Board Meetings his level of retention and absorption is very low. He has difficulty understanding presentations, flow charts, and figures. Instead he wants visuals. He would leave the meetings even if not yet adjourned,” an excerpt of the complaint read. According to the employees, Montano converted the TPB Board Room and executive lounge, meant for guests and for meetings, into an exclusive area for bodyguards and staff. He even requested a TV installed for them. In one golfing event with Taiwanese guests, Montano reportedly brought a woman and exhibited “unpleasant acts.” He reportedly did not sit down with the guests at the event. Also among the allegations raised by the employees are Montano’s allegedly questionable entry into multimillion-peso deals, undocumented travel orders and creating job orders for his own staff whose functions were already being done by existing staff. One of the multimillion-peso deals Montano allegedly entered into was an P11.2M contract for a concert, where he performed as guest singer with his nieces on Jan. 18, 2017. Montano also reportedly did not only hire his own staff including stuntman, gardener, personal assistant, family friend, but also his relatives including Priza Cinco, brother Rommel Montano and distant in-law Cliffer Mendoza. The employees noted that this is a violation of Civil Service Commission ruling on nepotism. Their salaries supposedly range from over P14,000 to P48,000 a month. The employees added that Montao hired “rarely visible consultants” who are paid P48,500 to P78,400 a month. The employees also raised concerns against the relatives Montano, who they said misused Department of Tourism funds by seeming to be on vacation during supposed business trips, declining travel to local venues for official business, and demanding reimbursements of expenses. “Ms. Priza Cinco, Mr. Rommel Montano and Cliff Mendoza always demand that their names be included every time COO Montano will travel domestically or internationally,” the complaint read. Cesar’s brother, Rommel, also allegedly initiated project called "SELPHILIPPINES," initially offered free of charge but later coming with a price tag in the millions of pesos. Cinco, on the other hand, supposedly threatened one of the office's human resources staff when the Civil Service Commission asked her to submit a document for her appointment papers. “Ano gusto mo, Duterte o COA [Commission on Audit]?” she allegedly said. Cesar was sworn in as the Tourism Promotion Board's COO last December.